Visible satellite image above shows two wildfire smoke plumes over northeastern New Mexico at 2345 UTC this afternoon. The larger fire is burning near Pecos (east of Santa Fe), while the one to the west appears to be west-northwest of Santa Fe. 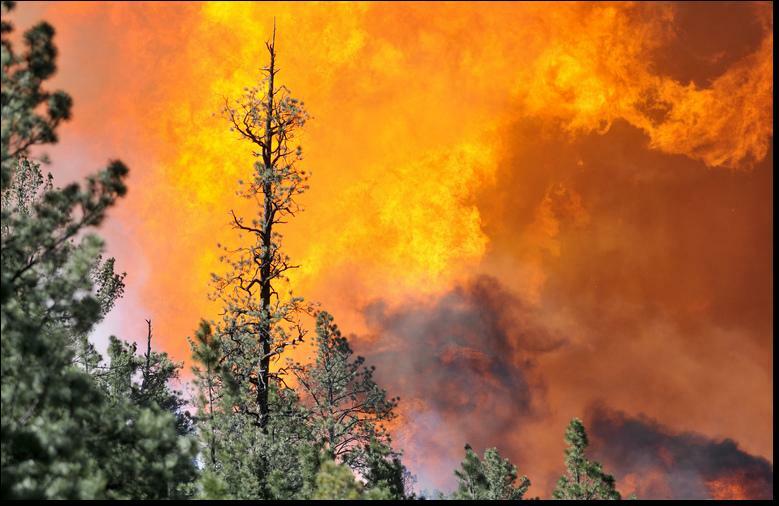 Photo below is of the fire near Pecos (photo credit to Eddie Moore of The Albuquerque Journal). It appears that there may be current and interesting information here. However, there is a catch. The products and information on this site are restricted and can only be viewed by persons having an email address within NOAA (see registration form below). This seems like a very strange way to do business. Regarding the dirty air post below, Mike says: The dirty air appears to be from dust that was from the coastal plains of Sonora. Animating the 1km vis imagery with the brightness turned up, I can just see some dust being kicked up yesterday afternoon. 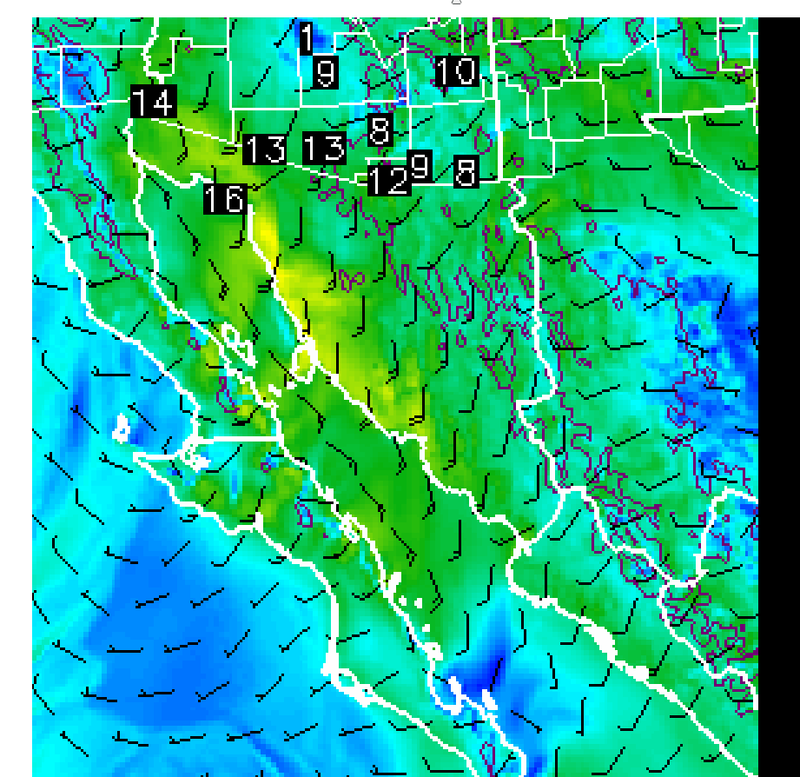 The WRF was forecasting 25 kt winds in the area due to the gulf surge yesterday and an observation from Hermosillo had a gust to 29 mph. There are some fires burning in the Sierra farther south and the smoke wasn't moving much. The WRF image is forecast winds and speeds from yesterday's 6Z run valid 20Z yesterday. 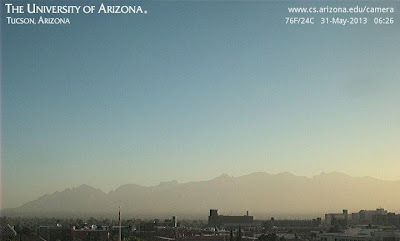 Here are 4 webcam views of the dirty air this morning (31 May 2013) with the views looking (from top to bottom) north, east, south and west. Mountains were partly to totally obscured when I walked at sunrise. I went to the Air Resources Laboratory HYSPLIT trajectory page to examine the questions of where did this dirty air come from and where will it be heading today. All the trajectories I explored (all from the NAM 12 km forecast data base at 00 UTC last evening) indicated that the low-level air (below 1000 m agl) over the Tucson metro area this morning originated over northwestern Mexico. The trajectory plot below shows where the model forecasts air parcels to move to during the next 18-hours. Each trajectory begins at 500 m over TUS airport and a new forecast begins each two hours today, starting at 12 UTC this morning (a bit before the photos shown above). Some of the dirty air makes it all the way back into Mexico. However, much of it loops around during the period, remaining trapped over Santa Cruz and western Cochise Counties. EDITED TO ADD: NHC did classify Barbara as a minimal hurricane at her landfall. How Did 6-Day Forecasts Do For This Morning? In an earlier post I compared the ECMWF and GFS 500 mb forecasts valid at 6-days for 12 UTC this morning. Graphic above shows the ECMWF forecast and graphic below is the 500 mb analysis for 12 UTC this morning from the NAM. The ECMWF was too deep and too slow, with height errors of as much as 140 m or more along the Arizona/Mexico borderlands. This was an unusually poor performance by the ECMWF. The graphic below is the 6-day GFS forecast valid at the same time. The GFS forecast was also too deep, but only on the order of 60 to 80 m, and very close on positioning. The open wave character of the pattern was what was observed this morning. This was a situation where the GFS forecast was considerably better at 6-days than was the ECMWF. Unfortunately, the only "weather" with this system over southeastern Arizona has been continued gusty, dry winds. This post refers back to the one on Friday morning, 24 May 2013. This Memorial Day morning there was a large MCS centered over southwestern Iowa at 1115 UTC as per above IR satellite image. The 1201 UTC regional radar is shown below. 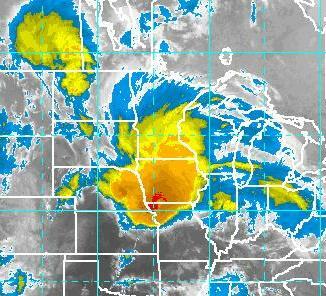 Nothing of significance over Wisconsin, and strongest storms north of Kansas City. The 24-h NAM forecast of 12-hour total rainfall valid at 12 UTC is shown above, and the forecast NAM radar echoes at 12 UTC are below. The model still was forecasting significant storms over Wisconsin and was not very good at 24 hours. This illustrates nicely that, while the models are much improved, convective storms, especially nocturnal MCSs, remain as a difficult forecast problem. The NWS watch and warning map from 12 UTC this morning is shown below. 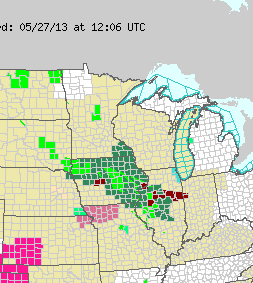 Red indicates flash warnings; light green indicates flood warnings; and dark green indicates a flood watch. The light pink is a severe thunderstorm watch. The NAM 72-h forecast, shown in the earlier post, did the best wrt to forecasting the observed convective system but forecast way too much activity over Wisconsin and Illinois. The Des Moines NWS Forecast Office provided best forecasts and discussion among the three stations I looked at on Friday. It's a hot and very dry afternoon here in Tucson area, with gusty, desiccating winds. 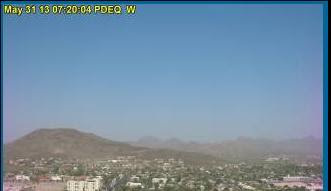 The view above is looking south from Kitt Peak a bit after 3 pm MST today (Sunday, 26 May). Nice view of Baboquivari Peak in the distance. Boundary layer is somewhat dirty, as it has been for weeks and weeks. Below are the current T, Td and RH time series for the airport, with latest observations below. 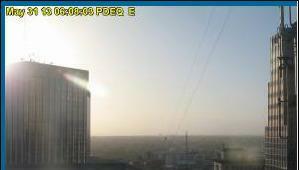 Temp is currently 95F with a dewpoint down at 0F - yielding an RH of 3%. The gusty west winds are sucking the moisture out the plants and folks who are outside. 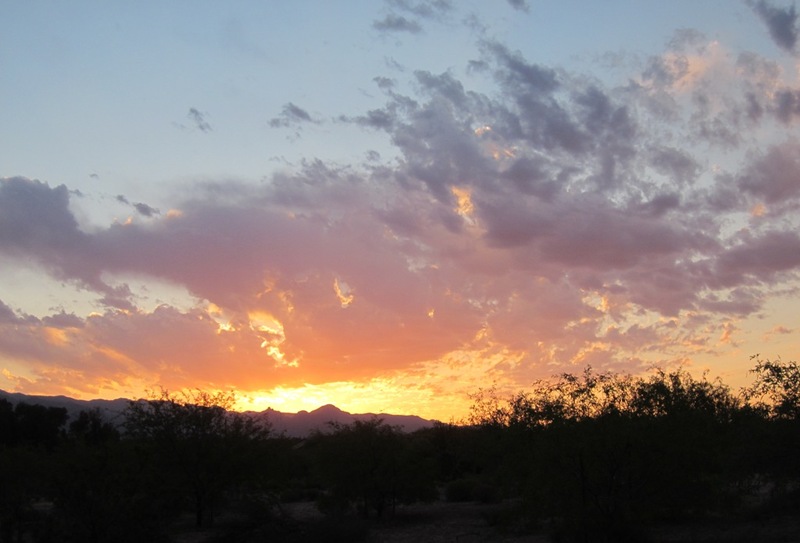 Typical late Spring conditions here in the Tucson area. A meteorological setting conducive to MCSs and locally heavy rains is forecast to develop over the upper Midwest during the next three days. Since it is a Holiday weekend, I thought that this situation was worth a closer look. The graphic above is the GFS forecast for 500 mb valid 12 UTC on Memorial Day morning. The central US is basically beneath a large ridge; however, several weak vorticity maxima are forecast to be embedded within the heart of the ridge. Such a setting is often associated with intense thunderstorms, heavy rains, and nocturnal MCSs. The forecast of 12-hour accumulated rainfall valid at 12 UTC Memorial Day, from the GFS, is shown above. The GFS forecasts significant, overnight rainfall from north of St. Louis to Des Moines to Omaha and northward., as well as a secondary maximum over northeast Kansas. The NAM model forecast for the same valid time and period is shown below. This higher-resolution model forecasts a large area of heavy rains over southern Wisconsin and a second maximum south of Omaha. Both models indicate a substantial area having the potential for locally heavy rainfalls, but with substantially different geographical foci. For example Madison, Wisconsin, has no rainfall in one model forecast but is at the core of the heavy action in the other forecast. The area with potential for heavy rains and nocturnal MCSs lies within a region of both substantial, low-level warm advection and high moisture content. I looked at the forecasts and forecast discussions that cover Sunday night for the NWS Offices at Madison, Wisconsin, Des Moines, Iowa, and Omaha, Nebraska. The discussion from Madison covered the developing situation well and mentioned various possibilities for Memorial Day. The discussion from Des Moines was excellent and included a briefing highlighting the possibility of serious storms over the weekend. One of the slides from that briefing is shown below. Shown here are the operational member forecasts at 144-hours, for the ECMWF (top) and GFS (bottom), valid at 12 UTC on 29 May 2013. The ECMWF is stronger and further south and the ECMWF trend has been toward increasing moisture with this feature. The GFS ensemble members have several forecasts that are similar to the ECMWF and 3 or 4 members forecast light rainfall over parts of southern Arizona. So, there is at least something to watch as the month draws to an end. First - several reports of snakes here on our circle. One neighbor discovered a 6 ft rattlesnake in her courtyard at the end of last week. I've never seen a rattler here in the neighborhood, nor on my morning walks along the Rillito Wash. Another neighbor reports that a large bull snake has taken up residence in her yard. A couple of weeks ago a neighbor re-located a king snake from across the circle down to near the Rillito. 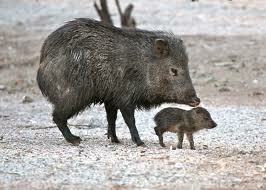 This morning a bit after 5 am I encountered a herd of 11 javelina near the intersection of Country Club and Allen (about a block north of the house toward the Rillito). About as many as shown in the photo above (not my photos - just examples of what I'm writing about). There were four large adults, 3 that appeared to be about a year old, and four tiny ones that were probably only a week or two old. The adults were VERY protective, and one stood on the path about 10 yards ahead of me making sure that I didn't come closer, and believe me, I certainly didn't. The little ones were even smaller than one shown below. I've seen a herd of five several times in the past, and this may have been them with new arrivals. 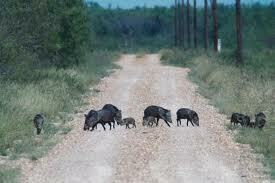 The wildlife sightings reflect the increasing severity of the continuing drought. Lack of water in the foothills of the Catalinas is causing animals to seek water and more abundant prey in the fringes of the city, where both are more easily found. It is said that Tucson is the most dangerous city in the country for domestic cats that are allowed outside. The large-scale pattern across North America remains very stable and the outlook for precipitation over the Southwest remains bleak. Here at the house the total rainfall for March through May to date is a scant 0.28". The above graphic shows total 10-day precipitation forecast by the NWS GFS Global model (operational version). The pattern seems remarkably stable to me as per the graphic below, which is the GFS Ensemble spaghetti chart and average heights for 500 mb out at 10-days. Very small spread over North America for this far out - all the spaghetti is over on the other side of the hemisphere. So, the long-term drought continues in this part of the country. Tropical Storm Alvin has now dissipated, vanishing as quickly as it developed. The early NHC forecasts for this storm basically were a complete bust, with the storm evolving much differently than was first anticipated. 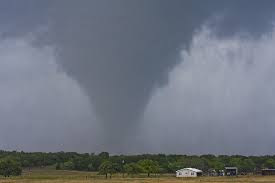 Wednesday afternoon (15 May) a number of tornadoes occurred in north Texas. The most deadly was an estimated EF-4 that struck Granbury, Texas, just southwest of Ft. Worth. The Granbury tornado killed six people and injured more than 100. Photo above is un-credited and is of a tornado near Milsap, Texas. The NWS Dallas-Ft. Worth Office has a preliminary damage survey up on their web page that documents 16 different tornadoes within a fairly small area of Texas. 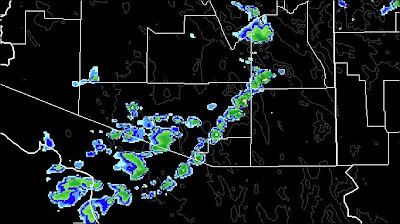 The early WRF-GFS forecast of the Tucson skew-T for 5 pm MST this afternoon (16 May 2013) indicates a more shallow and cooler boundary layer than we had earlier this week. 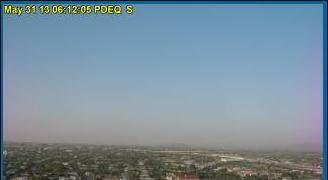 Looks like another afternoon with gusty, dry southwest winds. Above is the current NHC forecast for TS Alvin, indicating the storm will stay at fairly low latitudes during the forecast period. 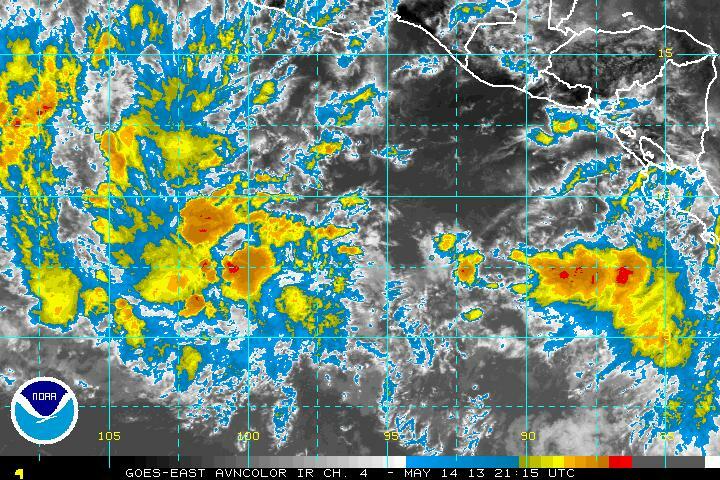 Alvin is characterized by a number of clusters of convection this morning and appears to be poorly organized. Update - the NHC has declared the first depression of the season to now be TS Alvin. The system is forecast to move toward the west-northwest and intensify to become the season's first hurricane. From NHC - A BROAD AREA OF LOW PRESSURE HAS FORMED ABOUT 650 MILES SOUTH OF ACAPULCO MEXICO. GRADUAL DEVELOPMENT OF THIS SYSTEM IS POSSIBLE DURING THE NEXT COUPLE OF DAYS AS IT MOVES WEST-NORTHWESTWARD AT 10 TO 15 MPH. 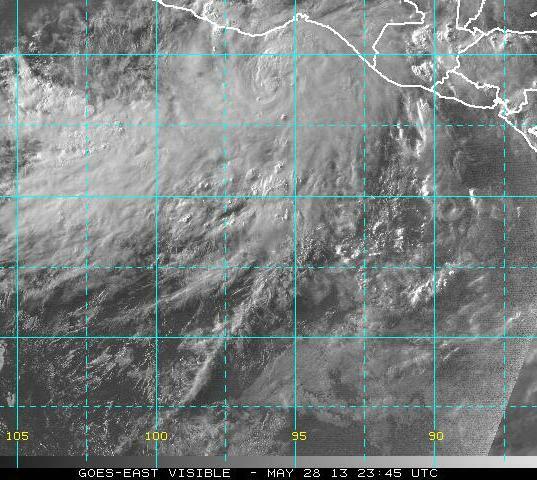 THIS SYSTEM HAS A MEDIUM CHANCE...30 PERCENT...OF BECOMING A TROPICAL CYCLONE DURING THE NEXT 48 HOURS. ADDITIONAL SPECIAL TROPICAL WEATHER OUTLOOKS WILL BE ISSUED IF NECESSARY...AND ROUTINE OUTLOOKS WILL BEGIN AT 5 AM PDT TOMORROW. Yesterday's early WRF-GFS forecast was quite accurate - see previous post. 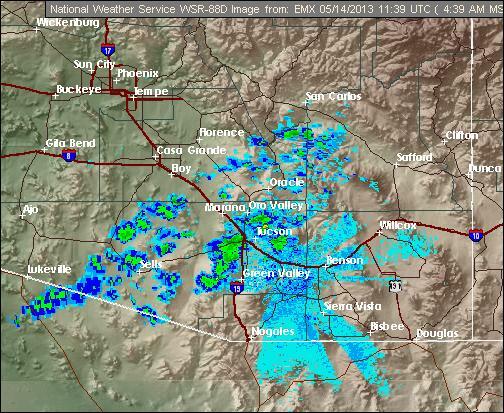 The radar composite image from NWS TUS (above) at 0439 am MST shows echoes similar to the model forecast. 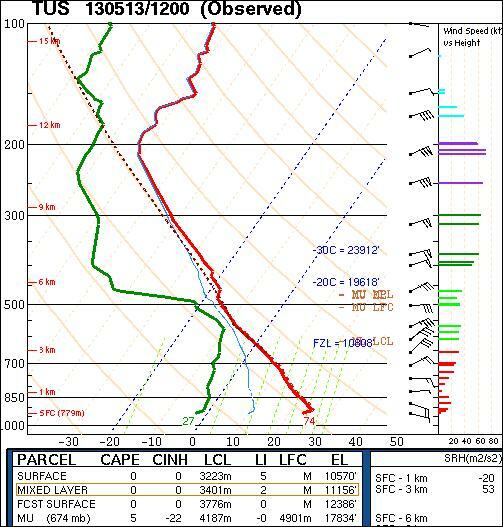 The observed TUS morning sounding at 12 UTC 14 May (below) is also very similar to the model forecast. Visible satellite image from 1345 UTC this morning shows a band of clouds and buildups (above). 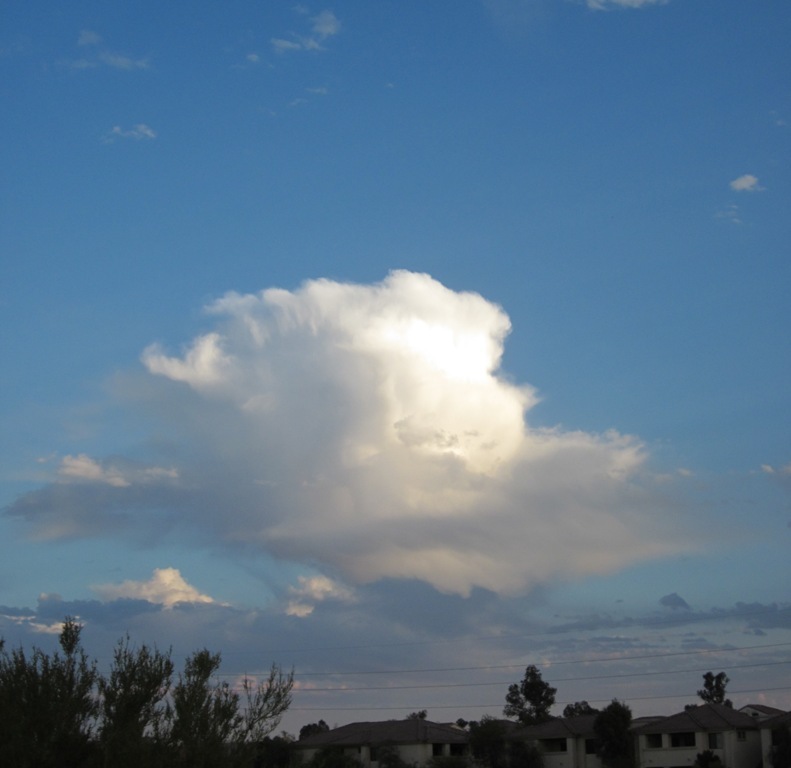 There were a few sprinkles about, but the high-based buildups produced mostly virga and some mammatus. there was a brief whiff of rain in the air here at the house a bit after 5 am. Images below were taken around 6 am MST this morning. The early WRF-GFS today forecasts a few light echoes over eastern Pima County this afternoon but keeps more significant echoes to the east and south - will check the morning forecasts later today (note added: Mike Leuthold reports that there were problems with the morning runs). This morning's 12 UTC 500 mb chart has a very summer-like look to it (above from Univ. of Wyoming upper-air page). 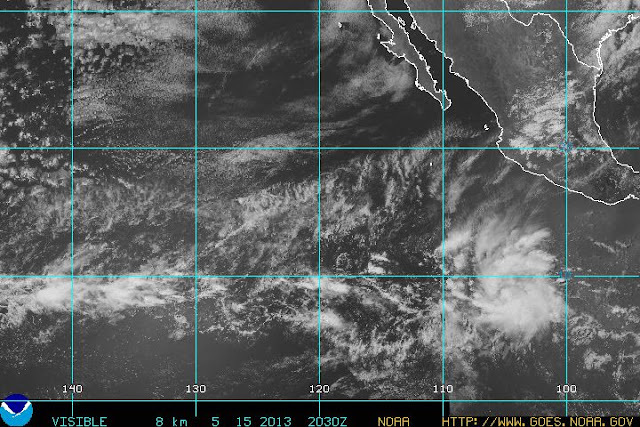 There is a broad, amorphous cyclone over northern Mexico and an anticyclone centered over the Great Basin. The mid-level temperatures, however, are cooler than they'd be in mid-summer. Temperatures associated with the cyclone are around -15 to -16C. 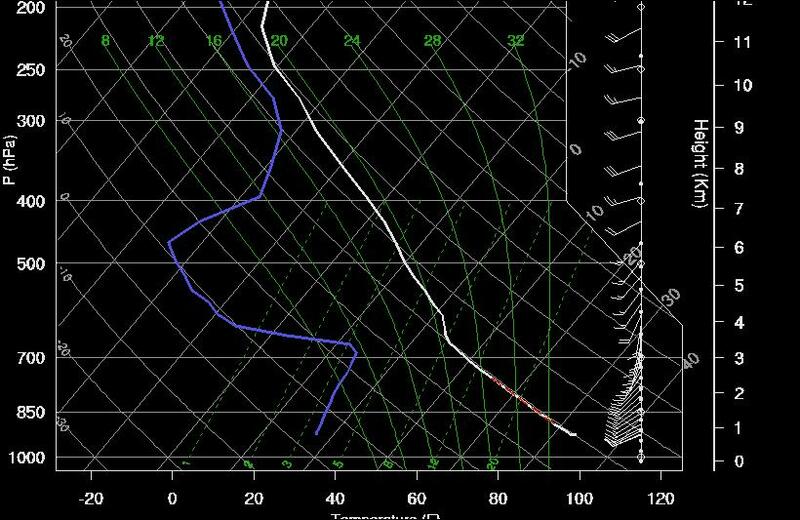 The morning sounding for Tucson (12 UTC skew-T below from the SPC) indicates that by afternoon the boundary layer will reach to nearly 500 mb. However, there is not much CAPE apparent, except perhaps a bit over the high elevations. So there may be moderate buildups on some of the mountains. When half of the troposphere ends up with a dry-adiabatic lapse rate, strange things can happen even with very limited moisture availability. At Atmo the early run of Mike Leuthold's version of the WRF-GFS forecasts some strange things during the night. 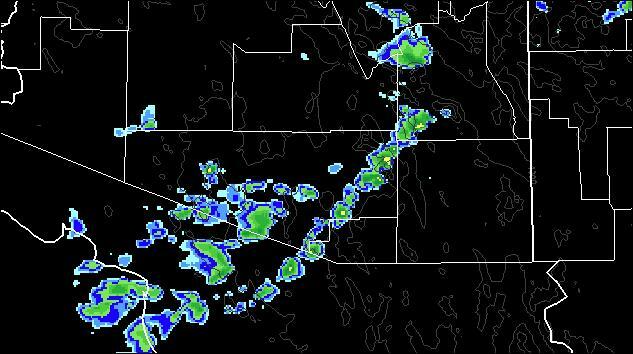 The above graphic is the model forecast of composite radar echoes valid at 4 am MST, early tomorrow morning. 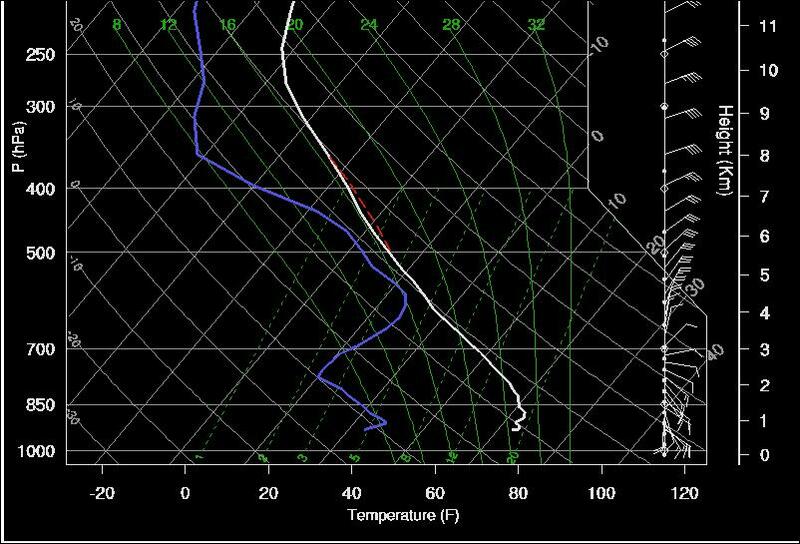 The TUS sounding forecast at 3 am (below) indicates that the model develops a bit of elevated CAPE during the early morning hours. If showers do develop they'll have high bases (near 600 mb) and wuld be occurring above a very dry and hot, residual boundary layer. So, the model indicates that it could be an interesting sunrise tomorrow and I'll be out taking a look.